P. 22 Ladybird Sweater. There should be 4 buttonhole rows in total. P. 74 Olivia Cardigan. Setting stitch markers before beginning lace pattern, this row should read: k10 (9, 11, 11, 18), pm, k23, pm, [k8 (10, 10, 14, 12), pm, k23, pm]3X, k to end. Next row (buttonhole row) (RS): k3, yf, k2tog, [k to 3 sts before marker, ssk, k1, sl m] x 2, k to end. 114 (122, 126, 134, 138) sts. *Work 15 rows straight in pattern. Next row (buttonhole row) (RS): k3, yf, k2tog, [k to 3 sts before marker, ssk, k1, sl m] x 2, k to end. 112 (120, 124, 132, 136) sts. Repeat from * once more so you have 4 buttonholes, ending with a buttonhole row. 110 (118, 122, 130, 134) sts. If you scroll below, you'll find images of corrected pages from a later edition of the book, which you can save or print and use at your leisure. P. 26. Noah Sweater. Please ignore second set of measurements given just before beginning raglan shaping. Second set of measurements can be used to determine length at the end of the raglan shaping. Sleeves: Repeat from *** 9 (11, 13)X more. P. 41. Hannah Jacket. Gauge is given in US 9/5.5 mm needles, not in US 8/5 mm needles. P. 50. Baby Cozy. Each instance of working in garter stitch after increasing is: Work in garter stitch for 5 rows. P. 55. Bloomers. Row 1 of edging is: k2 (yf)2X, k2--6 sts. P. 58. Shorts. After legs are joined, stitch count is 88(100, 112) sts. Next row: K to last 4 sts, k2tog, yf, k2. Next row: *K11, k2tog, repeat from * to last st, end k1. (73 sts). Next row: k to end. Next row: *K10, k2tog, repeat from * to last st, end k1 (67 sts). Next row: *K12, k2tog, repeat from * to last 5 sts, end k5. (83 sts). Next row: *K11, k2tog, repeat from * to last 5 sts, end k5 (77 sts). Next row: *K10, k2tog, repeat from * to last 5 sts, end k5 (71 sts). Work 4 more rows as established, including a buttonhole row. (99 sts). Next row: *k14, k2tog, repeat from * to last 3 sts, end k3 (93 sts). Next row: *k13, k2tog, repeat from * to last 3 sts, end k3 (87 sts). Next row: *k12, k2tog, repeat from * to last 3 sts, end k3 (81 sts). P. 74. Sophie. Row 1 of Raglan Section, stitch count is 72(64, 70) sts. Row 2 of Raglan Section, stitch count is 95(85, 93) sts. Row 3 of Raglan Section, stitch count is 103(93, 101) sts. Row 7 of Raglan Section, stitch count is 119(109, 117) sts. Row 10 of Raglan Section, stitch count is 92(91, 97) sts. Row 11 of Raglan Section, stitch count is 100(99, 105) sts. P. 75. Sophie. Sleeve for 0-3 months stitch count for Row 16 is 104 sts. All Sizes stitch count after joining to work in the round is 112(122, 126) sts. Stitch count when working even after side increases is 132(146, 154) sts. Page 83. Pants. Please ignore notes on Magic Loop under Tabs, as they are totally irrelevant. P. 86. Old Man. All Sizes R2, stitch count is 86 (92, 98) sts. Page 90. Ike Vest. Left Shoulder is: K10, cast off 15 (18, 21), k to end. Page 95. Autumn Leaves. Back and Sides, 2nd “Next Row” is: K1, p1, k1, p1, k18, pm, k51, pm, k18, p1, k1, p1, k1. Work 5 rows straight keeping 4 edge sts in moss st as established. Back and Sides, 3rd “Next Row” is: *K1, p1, k1, p1 (k to m, m1, sl m, k1, m1) X 2, k to last 4 sts, p1, k1, p1, k1. 99 sts. Work 5 rows straight keeping 4 edge sts in moss st as established. Repeat from * 5 times more. 119 sts. Page 96. Emily Dress. Materials: 3 (3, 4) balls Rowan Cashsoft DK. P. 112. Diamond brocade cloth. Row 5 is: *P1, k7, repeat from * to last st, p1. P. 116. Bib. Right Neckline, 3rd “Next Row,” stitch count is 8 sts. P. 124. Button Bag. Once you have 33 sts on needle and 33 sts on holder, slip 33 needles on holder onto left needle. Flap, Row 1 is: WS: K2, p29, k2. Flap, Row 2 is: RS: P2, k29, p2. P. 129. Maddox Hat. Earflaps are worked in garter stitch. P. 137. Monkey. Row that reaches 30 sts is: p2, p2tog, p to last 4 sts, p2togtbl, p2. 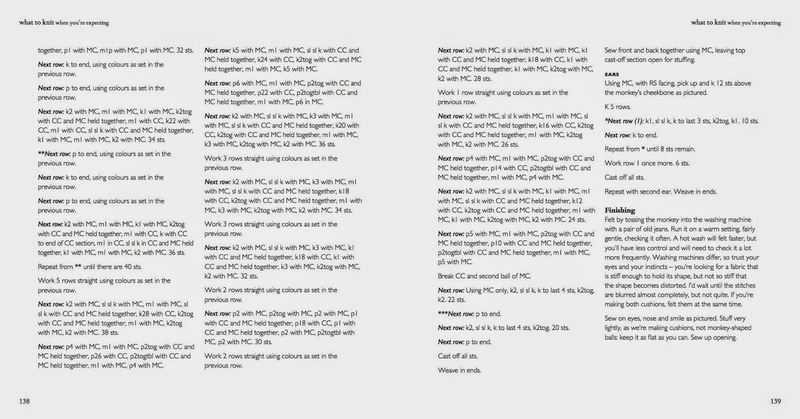 Row that reaches 32 sts is: p2 with MC, m1p with MC, p1 with MC, p2togtbl with CC and MC held together, m1p with CC, p20 with CC, m1p with CC p2tog, with CC and MC held together, p1 with MC, m1p with MC, p1 with MC. 32 sts. P. 138. Monkey. After working 5 rows straight with colors as established, decrease row stitch counts are 38 sts, 36 sts, 34 sts, 32 sts, 30 sts, 28 sts, 26 sts, 24 sts, and finally 22 sts. Page 139. Monkey. Third “Next Row” is: K2 with MC, sl sl k with MC, k1 with MC, m1 with MC, sl sl k with CC & MC held together, k12 with CC, k2tog with CC & MC held together, m1 with MC, k1 with MC, k2tog with MC, k2 with MC. P. 41. Hannah Jacket. Tension is given in US 9/5.5 mm needles, not in US 8/5 mm needles. P. 58. Shorts. Cast on 40(46, 52) sts. After legs are joined, stitch count is 88(100, 112) sts. Page 95. Autumn Leaves. Back and Sides, 2nd “Next Row” is: K1, p1, k1, p1, k18, pm, k51, pm, k18, p1, k1, p1, k1. Work 5 rows straight keeping 4 edge sts in moss st as established. Back and Sides, 3rd “Next Row” is: *K1, p1, k1, p1 (k to m, m1, sl m, k1, m1) X 2, k to last 4 sts, p1, k1, p1, k1. 99 sts. Repeat from * 5 times more. 119 sts. Yeah, that's in the errata--the pattern is written for only one size, 0-3 months, because my experience showed me that I stood no chance of squeezing a squirming older baby into one. Can I please check instructions for Noah jumper? Decreasing k2 sl sl knit to last 4 k2 tog k k. Why isn't pattern symmetrical? Hi! 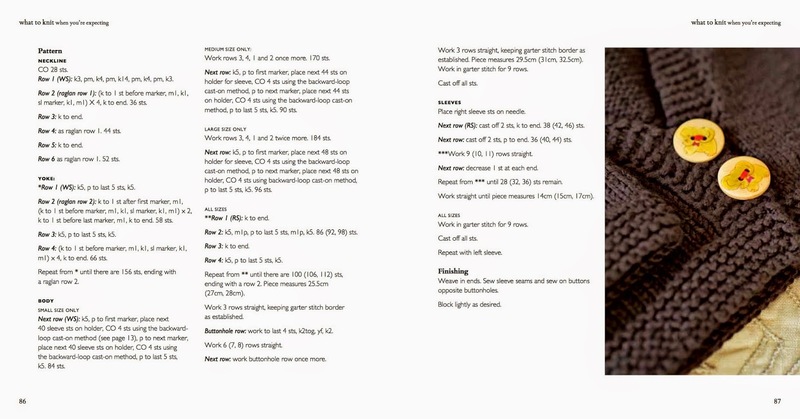 I need help with the striped boatneck page 70...I did size 0-3 and I think the sleeve is so long... What is the measure for the sleeves??? Thanks in advance!! The sleeve length for 0-3 is 22 cm. If that feels long to you, you can easily just stop knitting earlier, or increase slightly more frequently, and it should be fine. The French addition has most of these errors cleared up, but if you spot any, please let me know! Hi there, I just cannot get the neck right for the Noah sweater (everything else is finished). So when I pick up the stitches I have the work facing me (with the pocket facing me) picking up with my left needle working left to right? Then when they are all picked up I knit a row (so working from back of piece to the front again?) I just don't seem to get the garter stitch effect but rather a stocking stitch which doesn't look anywhere near as nice. Thanks for your help! Well, it sounds like I pick up sts in the other direction. The garter is actually brought on by the subsequent row and cast off, but if it isn't working out right for you, why don't you try picking up sts with WS facing? That might get the effect you want. Well, the "pssp" is certainly a typo, but actually we chose "yb" because it's a clearer description of what is required there. Yarn back, meaning leave your yarn in the back of your knitting, and then purl. And then take the yarn back again. The way you've written it is certainly also correct. Oh dear, that is confusing! It should read "Repeat from *** 9 (11, 13)X more." 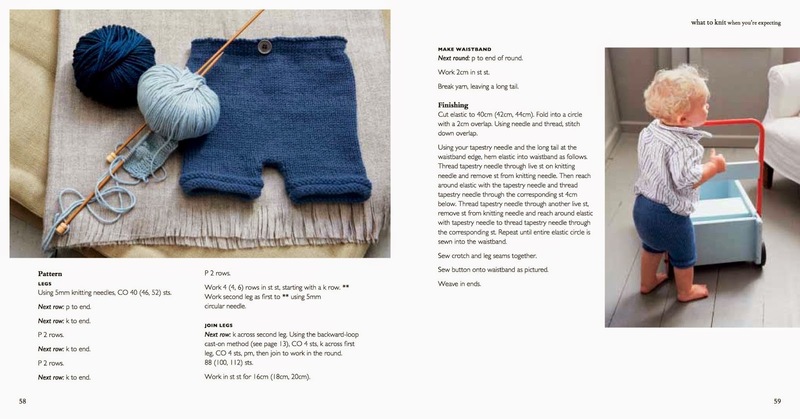 Hi Nikki, Looking at the errata page does the Maile sweater come in different sizes in your book? 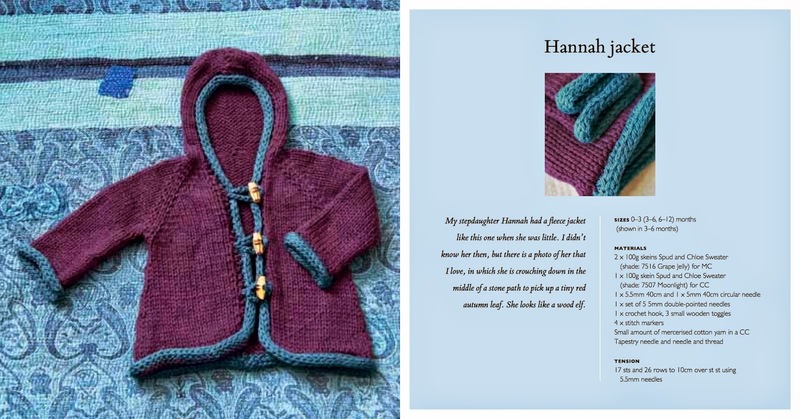 I'd love to knit this in a 9-12 mo size as my daughter will be 3 months in May. A pretty hot month in Texas. Yes! 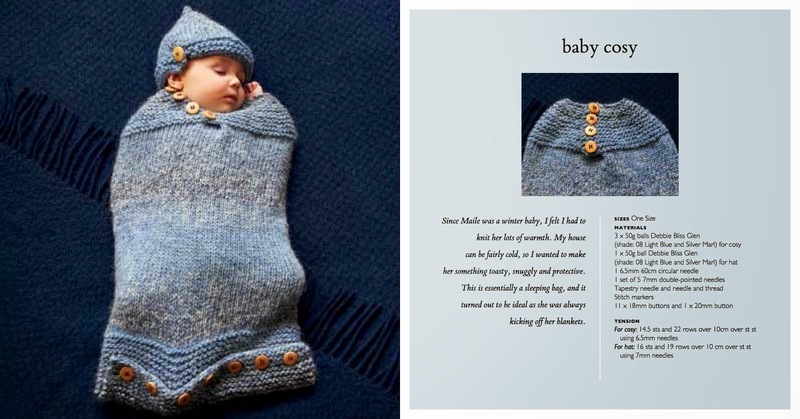 The Maile Sweater is available in 0-3 months, 3-6 months, and 6-12 months. I'm a bit confused with the shorts page 58 of the uk edition. I have both legs done; one on the regular needles and one on the circular needles but i am now stuck... I have knitted the extra row and casted on the extra 4 stiches on each but i don't know how to "join to work in the round" those two separate pieces. Could you please explain me how to do it? It's very simple, once you get your head around it--you just keep knitting! You should have all your stitches on the same set of circular needles, so you just place your marker, and then knit the next stitch. It feels very awkward at first--you've got lots of stitch pulling at each other around the legs, but it'll loosen up after five rows or so, and then you'll be in the clear. Thanks Nikki for your reply but unfortunatelly i didn't manage to do it so after a couple of attempts i had to give up... I will try to find an easier pattern later but for now i will knit the baby cozy. I'm having trouble with the Time Flies Booties. It's the part after row 18, you're supposed to have 48sts, which I did. Then, row 19 decreases by 4sts (yf,k2tog)x4=44. Next row knit. Then, the next row decreases by 6 (sl sl k)x3 (k2tog)x3=38, but I'm supposed to have 42sts by the time I'm finished row 21. Please help, even if it's my error. Thank you! The stitch count does end up being 42 by the end, because 18 + 3 +3 + 18 = 42. I think your error is in not working the yarnovers. There is no decrease on Row 19--the yf cancels out the k2tog. And then six sts are decreased on Row 21, bringing it from 48 to 42 sts. Thank you! I'm still sort of a newb, so I wasn't sure how to work the yf's. I did't know that they were yarn over increases. How do you do work that kind of yo? Thanks again. Just wanted to say that I love your book, and I am happy to say that I made your bib for my two niece's, and they looked great! It's just the same as a regular yarnover--I had a British publisher, and "yf" is how they write yarnover. I'm so glad you're enjoying the patterns! And if you can do the attached i-cord on the bib, you're hardly a newb! I'm so sorry to hear this, and thank you for letting me know...that is so frustrating, I'm sorry again! A) *work 5 rows straight keeping 4 edge sts in seed stitch as established. B) work 5 rows straight keeping 4 edge sts in seed stitch as established. Next row: * k1 p1 k1 p1 (etc.) Repeat from * 5 times more. 119 sts --- as per errata above. According to the row gauge, working 6 rows a total of 6 times should make it long enough, but if it's not as long as you like, I'd sugges putting more rows in between increases to get it where you want it to! Right, but in your correction above, you only repeat the increase rows, not the other 5. So the * should move back to the place where it is in the book. Ah, I'm sorry that's unclear. I was changing the instructions, not the number of rows. I'll retype--thank you for pointing it out! Some adorable patterns thank you so much! But question regarding the bloomers pattern error. I am just confused becuase I am not sure how to do a yf twice without a stitch afterit. Or maybe I'm reading this wrong. A yf is a yo, right? It is, and it feels a little surprising to do a yarnover two times in a row, but that's all you do--flip your yarn over your needle once, and then do it again. You'll knit into the front and then the back of those sts when you work the next row--it's done to create a big hole. Hi, I love the old man cardigan and would love to make it for a toddler. How can I adapt the pattern for a 4 year old? Thanks! Well, the simplest thing is to figure out the chest circumference you want to reach, and then work the raglan yoke until you reach that circumference, minus of course the sleeve sts. I would cast on more sts to make the neckline bigger, and of course work the body and sleeves longer. or knit those two rows then apply your corrections? 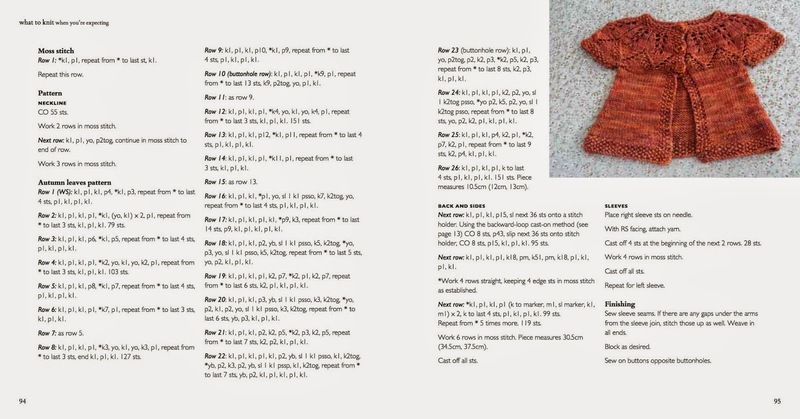 You should replace the neckline shaping in the book with the errata here--the numbers don't work out quite in the book. I am new to knitting and I am making Ike's Sweater Vest. I have finished the right and left shoulder for the back. I have transfered the sts from the holder to the needle. How long do I work the front until "RIGHT NECK (FRONT). You don't need to work even on the Front at all; the instruction to work in rows is just to let you know that you're no longer working in the round. Begin working the Right Front section right away! Oh, hahaha, I see it now. thank you so much. Just a quick question - working on the Hanna jacket (its sooo beautiful) I'm working on the body and I've just done the first row placing all the markers. I'm now going to work 5 rows then do the second "Next row". It then says to repeat from * 2(3,4) times more. There is no single * though - does it mean repeating from ***? So doing 5 more row between each increase row? That does mean "repeat from ***," you are exactly right. Sorry about the confusion! I am knitting the bloomers and I am near to joining in the round. You have specified to use a backward loop cast on and I was wondering if I could use a knitted cast on instead? Also, I modified the pattern to fit my 1 year old to last hopefully to 18 months and I was wondering if I'd need to cast on more stitches there at the backward loop cast on? There as there wasn't a different amount of cast on stitches for your size variations in that part of the knitting. Thanks in advance!! Also one other thing, I am still fairly novice to knitting and when you specify to join in the round, as my work is on two different sets of needles at this point and you've had me knit across both legs before joining am I to join on the wrong side row? You can absolutely use a knitted cast-on if you're more comfortable with that; I find a backward loop cast-on easier in that situation, but you should do whatever works for you! I'd cast on an extra stitch for the crotch just to be on the safe side. You should have finished with a WS row and have a RS row ready to go for the join (and yes, they should be on two different needles, and then you knit them together onto the circular needle. Thank you for the quick reply! I'm feeling less confused now after stepping away from it for the day and with your help. Thank you again! As well as when I knit into the next leg I am getting a ladder that keeps making me thing I am doing it wrong. I might need to just tighten up, probably. But I am feeling very novice today. I am an experienced knitter and was delighted to receive 2 of your books as a present. What to knit etc and 60 more baby knits. I've almost finished the Autumn leaves cardi and had made the corrections to the pattern before I looked for the errata. One thing that does puzzle me is that the needle size is given as a circular 30cm. I can't see the need to use a circular (I used a straight pair) and it is impossible to see how 151 stitches could be worked on a 30cm. I also note that a number of the other patterns are given as 30 or 40cm. Can you please clarify? I think what we're looking at with Autumn Leaves is just a matter of knitterly preference--I like using circular needles (though you're right, they're unnecessary here) and I like using the shortest ones I possibly can, hence the 30-cm and 40-cm measurements. Of course anybody can use whatever they want! Thanks Nikki. 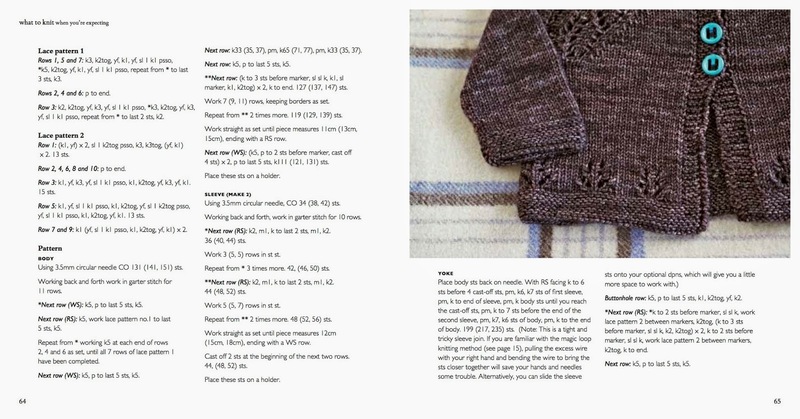 A pity I bought the 30/40cm sizes before starting the patterns in your book! I am happy using circulars when they are necessary. 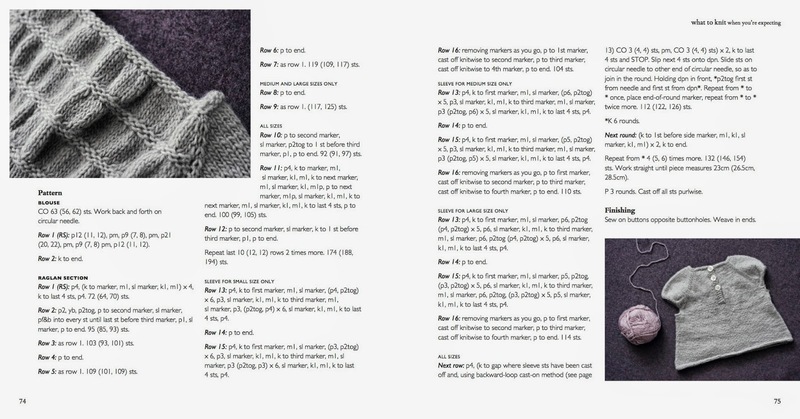 Re 60 more baby knits - still to knit from it and I had just assumed that it was by the same author. A question about the hat that goes with the Baby Cozy. I'm about to start the M1 increases, and it seems pretty straightforward to repeat from *. However, there is no starting *. So basically my question is this: is it really increasing every round, or is there supposed to be a knit round in between the increases? I've already made the cozy and had to improvise on the garter stitch section because I hadn't found this page yet, and I want to minimize future mistakes. Thanks! Sorry about that! The * should be placed at the beginning of that round. So the M1 is worked between the needles, one one round only. Baby cozy hat girl again. Increasing every round definitely did not work. After 3 rounds it became impossible to squeeze another make1 into the space between needles. I pulled it out and worked a knit round in between each increase round, and it came out perfectly. Hi there, I am just in the process of knitting my first sleeve for the Noah sweater (size 3-6 months) and I am stuck. I just did my last (K2 M1,K to last 2 st, M1, K2) and ended up at the correct 40 stitches. Now it says to work even until piece measures 6.5 inches, but my whole piece is already 6.5 inches. Should I use the second set of measurements and knit in stockinette until the piece measures 10 inches? Then start the casting off 2 stitches at the beginning of the next two rows? Thanks so much in advance for your help -- I am 35 weeks and want to get this one done! If you're already at the 6.5 inches, then you're good to go! Just carry on with the next step. The second set of measurements is an error, please ignore that! I am picking up across the back neck on Ike vest. When the numbers are corrected for the cast off on the back (see Ike errata). There are only 15 stitches there. Do I still try to pick up 24 in that space. Thus is for the 0-3mos size. The short answer is yes--I wanted the neckline to be super stretchy so it wouldn't be difficult to get over big baby heads, so I did intend to have so many stitches picked up there. However, if it's uncomfortable for you, or just isn't feeling or looking right, don't bother! Pick up whatever number of stitches feels right. I am working on the Maile sweater. On page 65 under Yoke I am bit confused. 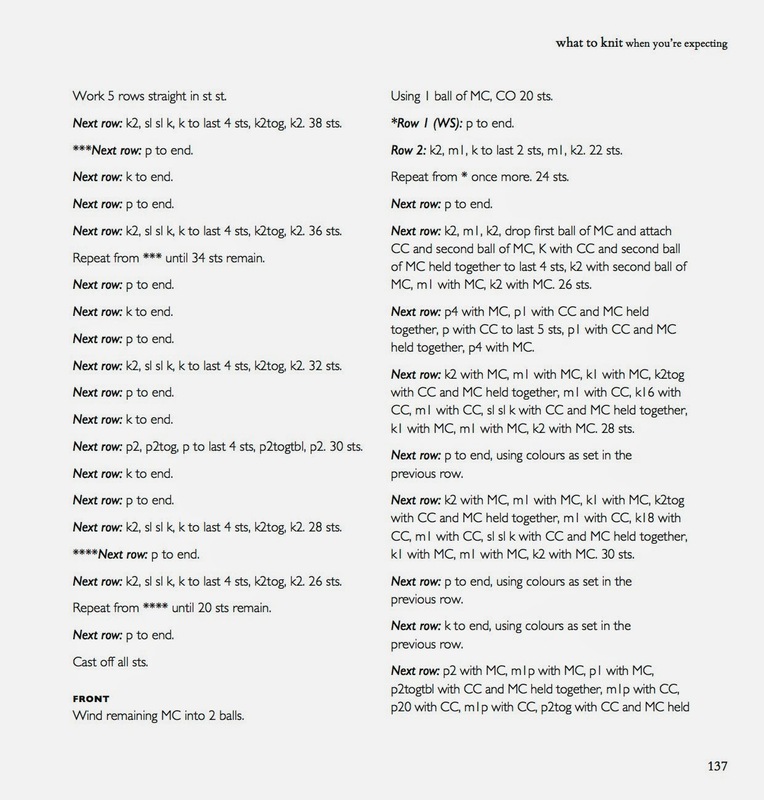 Instead of the usual 0-3(3-6,6-9) style of writing instructions; eg 4(5,6) it says just pm, k6, k7; etc. I am knitting the 3-6 size and am not sure which to follow. Granted, I am still on sleeves, maybe it will make sense when I get there. Just anticipatory anxiety? Actually, that does read confusingly, but is not a size separation there--all sizes do the same thing. Place marker. K6 sts of body. K7 sts of first sleeve, etc. It will make sense when you get there! I think if it's working out fine, you shouldn't worry about it! The only thing to pay attention to is making sure that there aren't too few stitches on the edging, which would cause it to pull tight. I am working on the Ike tank top. When I get to the Right Neck (front) section, If I start decreasing in K and leave remaining stitches on a holder I would be working on the LEFT side, not the right. I need to know which is the front centre edge so I can decrease as following the pattern. Thanks Irene. The Front Center edge is the one without the cast-off edges for the underam. Oh thanks for the response, Nikki, but I may have posed my question badly. I need to know if the "sl sl k" is on the armhole side or the neck edge, so that I can work out the left from the right sides. The Right Neck is what we're working, because you're turning to go back the other way--which, when it's being worn, is the right side. So the p2tog sts are at the neckline. If you start knitting and knit up ± half the stitches, leave the remaining stitches on a holder and purl the next row, you are knitting on the left side - left of the wearer, that is. At least that's how I see it. The first side is the left side. I must be doing something wrong. Thanks for your patience here! You must be a patient person, because you are a great knitter! I think you're not visualizing it quite right...but not to worry! I would say trust in the pattern and it'll all come out! Help please! I'm working on the little old man cardigan on page 86 of the uk edition. It is my first attempt of a sweater so I may be a novice, however, it appears that the pattern only leaves room for one sleeve. When I slipped 44 stitches to my stitch older, I only casted on 4 and then purled 2 or so more before slipping another 44 to a stitch holder. If the 44 stitches are individually representing the sleeves, they appear to be too close to each other. If together they form one sleeve then how do I insert the second sleeve. I am hoping I don't have restart this project... I might cry! Lol. I could email you pictures if that would help. Ike Sweater Vest- I am lost.Left shoulder rows don't work out for me. I changed to k5,cast off 28,k to end. The next 3 rows I am lost. Please help me. Such a beautiful collection of patterns for the wee ones. This proud grandmother has used many of these patterns with amazing gifts to give as a result! Did you look through the errata on this page? It should be: K10, cast off 15 (18, 21), k to end. That should solve things for you! I am following the Baby Cozy pattern from the book. I like the flap. I notice that the corrections say to work in garter stitch for 5 rows after each increase. However, in the online version of the Baby Cozy pattern it says to work in garter stitch for 3 rows after the final increase. Which do you suggest for the book version of the baby cozy, 3 or 5 rows? Thanks! 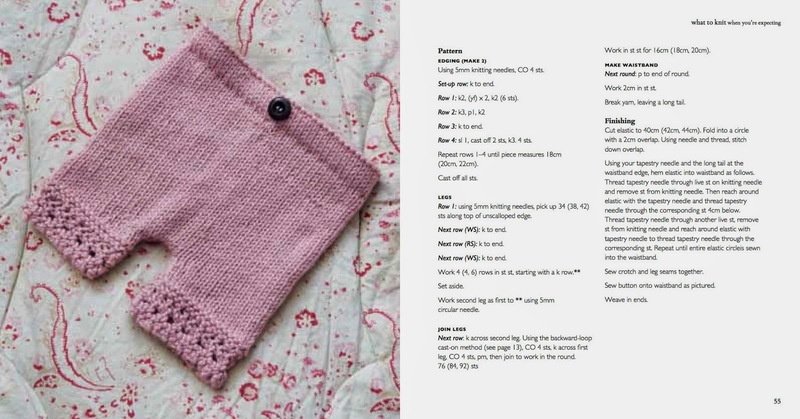 The online version doesn't include the flap, which is why the garter stitch is shorter--if you like the flap, stick with the book version! I'm working on the Baby Cozy (book version) and have gotten to the Body. I have 88 stitches as indicated. The subsequent instructions say to join then work 68 stitches and pm for the end of the round. Is 68 a typo? Should it be 88? 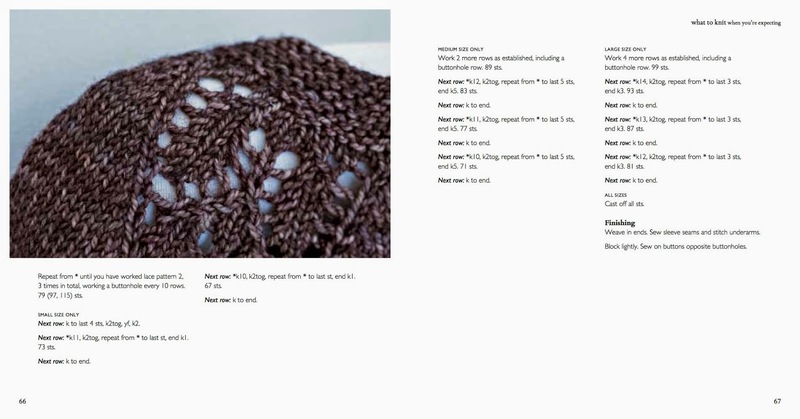 Also, in the book you do not indicate the length of the circular needles but online baby cozy you indicate 24". What is your suggestion for the book version? Does it matter? Thanks! It should be 68--this places the end of round at the back of the cozy. And 24-inch circular is what I feel comfortable with, but I like them on the tight side--if you have a different size circular needle and it'll work, feel free to use that! So, I made your autumn leaves sweater for my 4 month old, but it fit my 3 year old. Uh oh! :) I used a different yarn, but the gauge was almost the same, just one stitch smaller. It's super cute...just the wrong size. Any tips on making it in a smaller size? I didn't notice stitch numbers for the smaller size in the pattern. Thanks! A change in gauge can make a big difference, though that does seem really different! I would go down yet another needle size, and use an even thinner yarn. Thanks for replying to these all individually! Does this mean they are on either side or the cardigan rather than the same side? Or have I got baby brain?! It should work out so that the buttonholes are on the same side--an even number, and then a buttonhole on the following row should get you back to the same side, yes? Oh, I see what you're saying! Yes, clearly that is a mistake--it should obviously be an odd number. Work it for seven rows. Will post a pic on Ravelry when it is done. Thanks again. 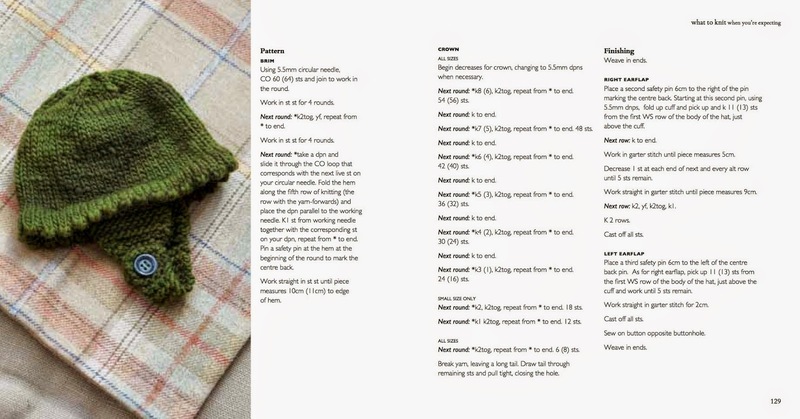 I am knitting Autumn Leaves from your book (not the free pattern online). I saw that someone had previously asked about the instructions for Row 22 within the *, but I had a question about the stitches before that part of the row. Should this "yb" be a "yo"? Or are you supposed to hold the yarn to the back while you slip 1 and k1? You're supposed to keep the yarn to the back--I just wanted to make sure there weren't any accidental yarnovers. Ok, so for the beginning of the row you are not doing any increases. Then once you start *yb, p2... you will be increasing since you are purling with the yarn at the back of the work. Is that right? Can you add all the corrections to the baby cozy hat? The instructions in the book are clearly wrong, in more than one place. I see that others have had a difficult time completing it. Unfortunately, I don't see where the corrections are listed. Hi, just finished the hat to go with the baby cosy, and found some of the instructions tricky. Finding this page and using the photograph helped, and the finished items look right. Follow pattern until 'repeat from *' then, as noted by a previous commenter, the * to repeat from is missing. Following their advice I knitted 1 row between each increase row until I got 48 sets. Next follow the pattern and knit for 6 rows. Then p to end and CO 4sts at the end of the row before turning. Purl next row, Turn. Purl 44 sts p2tog yo p2, turn. Garter stitch 3 rows. Cast off. I have the US and Canada edition. This and the tutu are the first ones I've knitted from the book, and I love the originality of the designs. Maybe an errata page could be included with the book? Hi Nikki,I am a new knitter and making the baby cozy. I did not learn of the error or the size (0-3 months) until after buying supplies. Unfortunately, a baby cozy is completely unsuitable for August in my location, and I was planning to make it in the 3-6 month size. Do you have tips that a novice could follow for increasing the size? Hello, I am working on the Summer Sky Blanket (pg. 22), I just learned how to pick up and knit. I was wondering if anyone could explain how we pick up 97 stitches on the CO edge if there are only 96? Also, when we turn the blanket to pick up along the vertical edge it says to pick up and knit 6 st after turning counter clockwise. I guess I was wondering how we are to pick up 6 when there are 11 stitches, and how do these st go longer than the MC? Not sure if that makes sense, I'm confused enough that it's hard for me to explain it, sorry. It's a little tricky, but frequently knitting patterns will ask you to pick up a different number of stitches than you see in front of you--usually less. You just kind of evenly space them out, and in the case of the extra stitch, you can pick up into the front and back of the stitch. I am working on the Sophie Blouse and got about 24 rows done when I realized there were no buttonholes in the pattern. Any thoughts? I am now frogging all the way back to the beginning. The pattern is actually written for to be knit straight--I only recommend circulars because of the number of stitches. You're welcome to use straight needles if you like! I'm not sure what you're referring to--I don't specifically state which rows are buttonhole rows, but they're there! Row 2 of the raglan section is a buttonhole row, for instance. I'm knitting the edging on the Hannah Jacket. 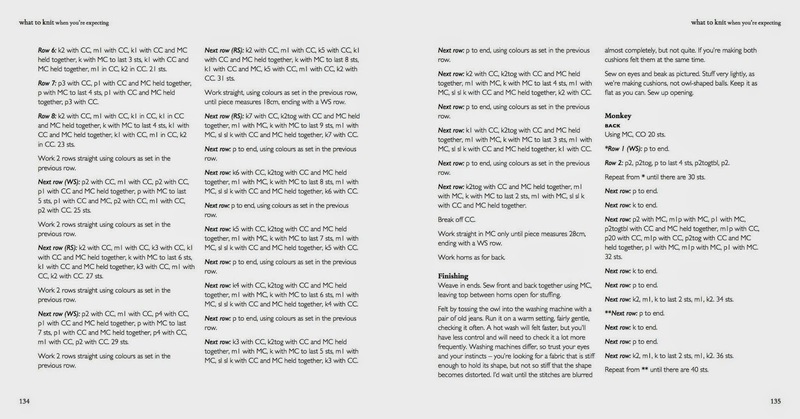 I can't get the I-chord look based upon the picture and the directions. Was there an error in the photograph? 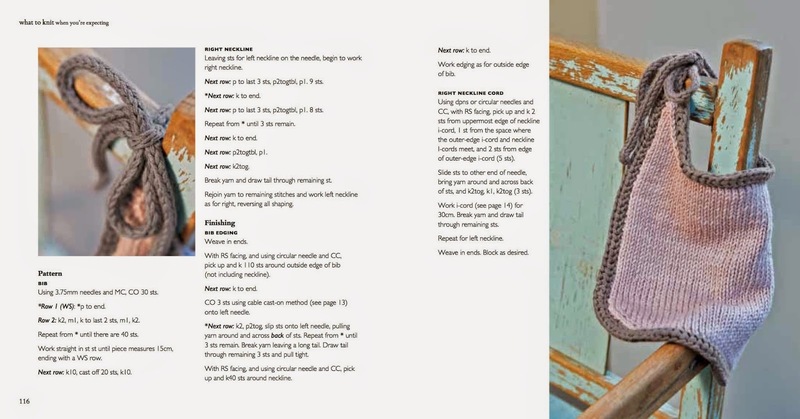 Maybe there was an omission on the instruction regarding knitting a whole separate I-chord and sewing it on the edge? I found the given directions on pg 43: k2, p2tog (wrap yarn around) slip sts back onto left needle ambiguous and very tedious once I got it going. It doesn't look a bit like the picture. What gives? Hi Nikki. Love your creations! We were lucky to have an extract of your book (the Kalen cardigan, p91) on our website but I have had a comment from a reader. Are you able to answer this? "Hi, I just started this adorable sweater for my grandson and on the Back working as a 3T,(51) I can’t seem to come up with the same sts as I have 31 sts left on after doing the 10 rows and do not know how to come up with 21 sts, was it a typo? I will start the other sections and would love to hear from you. Thanks"
The numbers in the book add up correctly for me. Are you decreasing one stitch at each end? Have you repeated the decrease rows the correct number of times? Thanks Nikki. I will pass this on. I'm a novice knitter and I'm currently working on the leg warmers from page 36. I was trying to figure out when i'm working Round 2 of the Turn Leaf lace pattern, it says "keep yf, k2" and I was wondering if i'm supposed to keep yf for both those knit stitches or just the first one? Any help you can give me would be great. Thank you! What happen with de Spanish Edition? Could you tell me the erratas? Because I´m knitting some patterns and I've found it... I can read the erratas in english here, but not some spanish people that buy this book and don't speak english. Could you include the errata page about this edition? I have a question about the Sophie blouse. I am not sure whether I am understanding the pattern correctly. I have the UK 2012 edition and am knitting the largest size. I have knitted the raglan section row 1-9. In the erratta section and corrected pages it says that you should have 97 sts after row 10. I think iI am misunderstanding the pattern here, because I am counting to 98 as it mentions in the book. On my needle I have 17sts, marker, 18 sts, marker, 55 sts, marker, 18sts, marker and 17 sts. After I knit row 10 I would have 17 sts, marker, 18 sts, marker, 28 sts (in row 10 I have to p2tog to 1 st, so that is 54/2=27, p1), marker, 18sts, marker, 17sts. Hopefully you understand what I am writing. What am I misinterpreting? 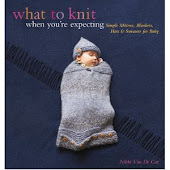 I have a Japanese version of "WHAT TO KNIT WHEN YOU’RE EXPECTING". I'm going to think I'll knit a leg warmer from the book. But the figures of the stitch don't come out right in "turn leaf lace pattern" of description on the book. Its pattern is described as follows by the book. I translated from Japanese into English. I also sent a mail of the question to the Japanese publishing company, but a reply had not come. If it's different from English version, could you tell me the right pattern? Thank you for telling me the right pattern. I can begin to knit a leg warmer. I think I'll upload a work in Raverly if I begin to knit. Hey Nikki! I love your book and knit from it all the time! I am making the honeycomb blankie for the second time and I find myself having the same question. My honeycomb pattern section just doesn't look like the pic and I must e doing something wrong. How do you carry the cable pattern over the markers? If I am on a C2F, C2B line, should I begin after the markers with C2F in each section or follow in the pattern? Hope that makes sense. Help!! I would view each section as starting the pattern over, so c2F after each marker. It is tricky though, once you start working in the increases. 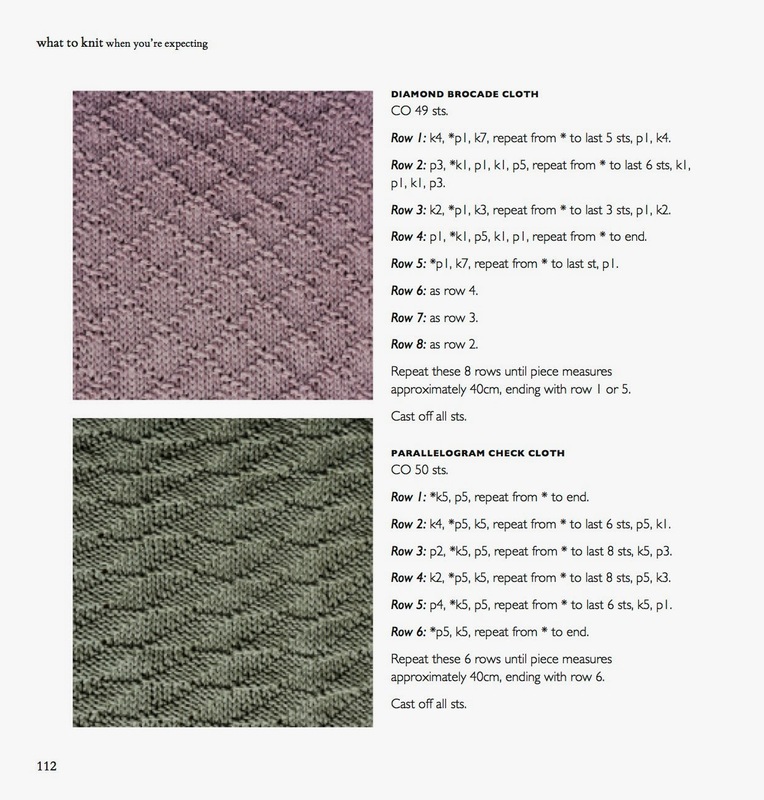 What I would suggest is knitting a swatch of the honeycomb pattern, so you're familiar with it. Once you see what it's supposed to look like and feel like to knit, it'll be much easier for you to work around the markers. I'm not sure I understand where you're at...the third row of the pattern repeat ends with "k to end" and it should just be k5, not k6. In fact, R3 is a RS row, so there's no purling at all...I'm trying to guess where you're stuck at, but I just can't find it! Haha! Sorry! Can you tell I have 2 year old! Clearly exhausted!! So on the third row I only 4 stitches left to knit, not 6.... The 1st and 2nd row work perfectly. can you help? Thank you! Can you help me, I'm working on the legs warmer on french version. 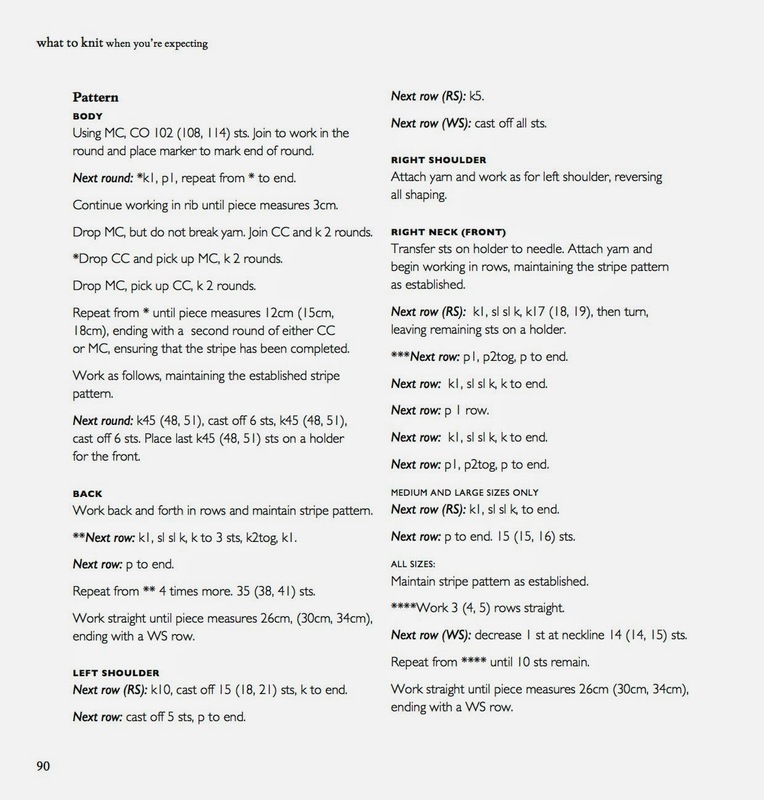 it tell me to decrease each row 4 times on Stockinette stitch. On the photo I see it's not each row but how?. I hope you understand my english. thank you. Thank you Nikki. All is so beautifull. "Bonnes vacances"
I have a question about the Keaton Cardigan, smallest size in The Toddler Years, p26. After Buttonhole 3 have 174 stitches. Next instructions are : Work Raglan Rows 1 and 2 1 time until you have 174 stitches. This would add 8 stitches so I have 182 stitches. Is this a mistake? Whoops! Yes, that's a mistake. Don't work the extra set of increases--your stitch count needs to be 174. Hi! I absolutely love your book, and I've made several things from it, but I'm having LOTS of trouble with the Emily Dress. Hmmm...yes, everything should line up! How wide are your scalloped points? They should be only thirteen stitches across, but it sounds like they are more/less than that. I would suggest working the rib as it lies (so p3, k across the scallop) and increase or decrease as necessary to get it to 13 stitches. Im working on the Hanna Jacket (Canadian version) I've just begun to knit the body, the first directions are to "knit 5 rows as set" what are the set rows that I am to be knitting here? Im so confused lol. Sure! What's going on, what do you need? I've been having a bit of a problem with the Autumn Leaves cardigan which I'm making for my best friend's little girl. I think it's on row 22 (which I know has been commented on a lot). I seem to be decreasing stitches on this row which I assume isn't correct. To me I seem to only be making up one stitch with the yb before the p2 which accounts for a stitch lost on the sl 1 k1 psso, but another is lost on the k2tog. The yb before the slipped stitch doesn't make one as it has the yarn at the back for a knit stitch? I think this is where I went wrong. It's my first time doing any lace work so making a few mistakes here and there. I was a bit confused but continued on until the end of the lace section and suddenly didn't have enough stitches at the first row of the back and sides. Please help! Yeah, it sounds like you're not picking up that yarnover! When you do a yarnover before the purl 2, make sure you find it on the next row--that can be a little challenging, as sometimes, even if you've remembered to do the yarnover, you can't always see it clearly on the needle when it comes time to work it on the next row. And yes, there should be another yarnover before and after the sl 1 k1 psso--bring the yarn to the front and then knit that. Not to worry, lace can be tricky! Im working on the Sophie Blouse and I've come across a problem. Im doing the smallest size and just finished row 7, I have 109 sts as Im supposed to. Row 10 says to "p to second marker, sl marker, p2tog to 1 st before third marker" this means Im supposed to p2tog every single stitch from the second marker to the third marker correct? When I do this I finish row 10 with 84 sts, not 91. Am I doing something wrong? Or is the stitch count off? I recently bought a book and yesterday started to make the Button Bag for the present. I did the first part - 12 cm. Then took off the 33 stitches onto the stitch holder. Started to do the flap. Then I got puzzled. I thought this looked like an actual bag where the kid can put small things in.. But it I do the flap AND cast off the stitches on the holder, I will actually have a 12 cm piece with a flap. Makes no sense to me. How to obtain the bag part - where you can put something in? So, if you've done the slipping stitches thing, that will work out so that you have made a bag, rather than just a rectangle--half the slipped stitches will be cast off, creating the bag, and the other half will be worked creating the flap. If something went wrong with slipping the stitches, then I would suggest knitting a really long flap and then seaming the sides to create a bag, rather than starting all over, since that's so frustrating! Nikki, many thanks for the reply!!! At the moment when I got your reply I had figured out the problem - accidentally by the way. 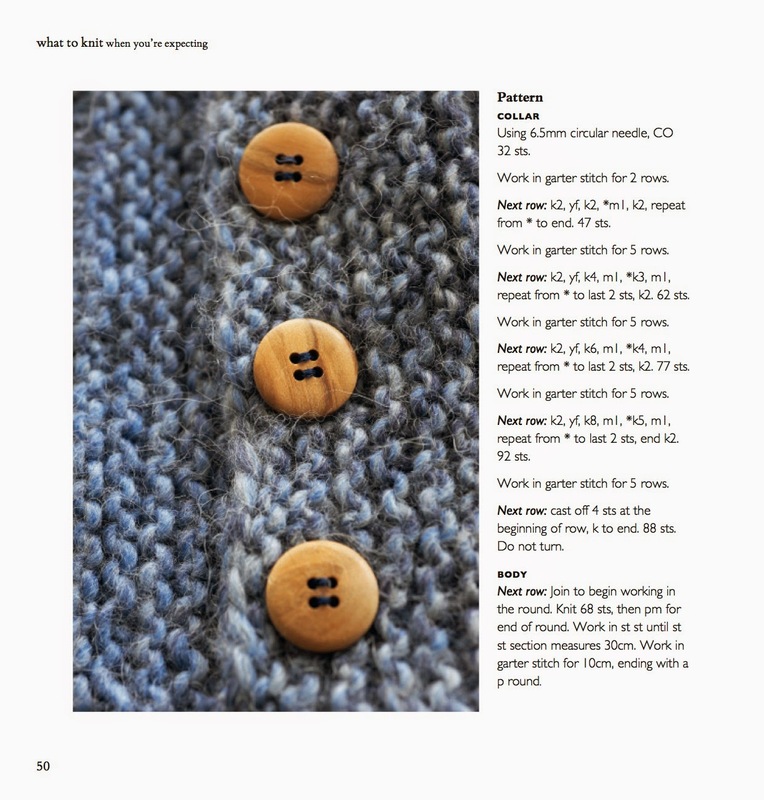 After doing part of the flap I noticed that my version of the book lacks the text "The bag is knitted from the inside out, and this kind of slipped-stitch double-knitting allows you to knit in the round with a pair of straight needles!". The book is the translation and I guess someone didn't think this part is important. But it is. When I read this sentence online I realized, that there is something I'm missing. Apparently when dividing the stitches I had them mixed on wrong needles. Thus my bag surely did not look like a bag, but a rectangle with a flap. 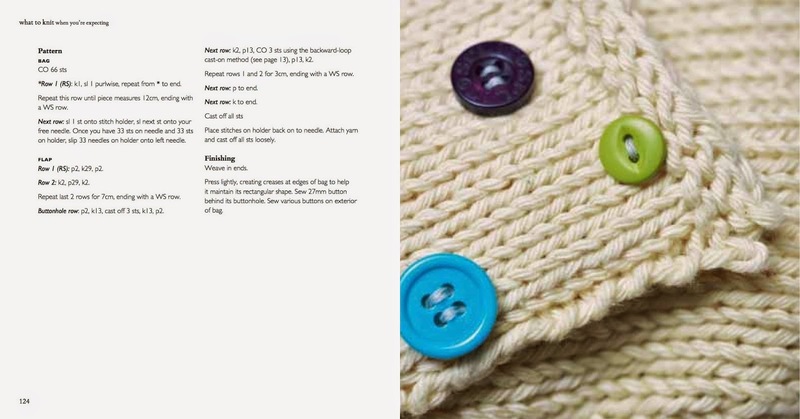 I want to knit the Autumn Leaves cardigan from the book but it doesn't seem to have the adjusted sizes. Am I missing something? The sizes change based on the gauge--so different weight yarns are used for each size, and for each needle size as well! I'm making the Autumn Leaves sweater/dress, and it seems to have an odd notch where the stitches are bound off at the armpit. I'm stuck since it looks really odd. Please advise. Wish I could post a picture of it. Is there some way I can send you a picture of it? I have knitted the whole thing, and would not like to rip it all out. - Rowan Belle Organic DK is no longer available but I found a comparable yarn, Blue Sky Alpaca Skinny cotton listed as a DK. This leads to my questions - I've found knitting on size 8 needles, the cloth is very open. Is this done purposefully given that we're working with cotton and cotton shrinks in the wash? Or, after looking at the yarn, do you recommend smaller needles - and how many sts would you add to the width to make up the distance lost by working on smaller needles? Do you have any other thoughts? This is entirely up to you! I have found that cotton shrinks, so I did make it a little more drapey than I might otherwise--and I just liked the way it looked and felt! If you want a tighter weave, absolutely go down a needle size or two. And honestly, cast on as many stitches as feels right. You can spread them out over your needle to see if the dimensions look correct, and just check to make sure your stitch count works with the pattern you're using. Thanks - I had intended to use the same yarn for the bibs and am concerned it'll make a difference there. What are your thoughts? Thanks or your help - there aren't people here to ask. Also - I'm currently working the leg warmers (super cute!) - this is the first time I'm doing a lace pattern and have a question about the row directions - This seems straight forward enough but it's looking a bit odd - yf K5 for example - does this mean yarn in front for all 5 of the next knit stitches (ie: yfk1, yfk1, yfk1, yfk1, yfk1) which is what I've been doing, or, am I reading it incorrectly? I'm on the second repeat of the lace pattern and am concerned they are growing in width too quickly/inappropriately. I'm working the 0-3 mos. size - how many sts should I have when I'm finished with the lace pattern and ready to start the cuff / how many increases should I have per one repeat of the lace pattern? I'd rather confirm with you and make sure I'm on the right track - so thanks for your help! Uhoh! No, it's yf, k5--so one yarnover, and 5 knitted stitches! 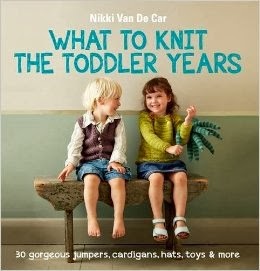 I knitted a blanket for my baby and got the knitting bug so bought your book "What to knit: the toddler years". My first project is the pinafore dress which I'm managing pretty well. I've just read further down the pattern to see what's to come and have a query on the number of rounds to knit immediately before the bottom fancy edge. It says work 12 (13, 10, 11, 12) rounds which doesn't seem right. Why is the biggest size the same as the smallest size, and the middle size the lowest...? Can you please advise? Totally logical question!! The long answer is, it's because of the number of rounds needed for each size to get it to an even length between sizes after all those increases. The short answer is, it's because I'm a little neurotic and my publisher didn't catch this instance of my neuroses showing. It'll work out, trust me! 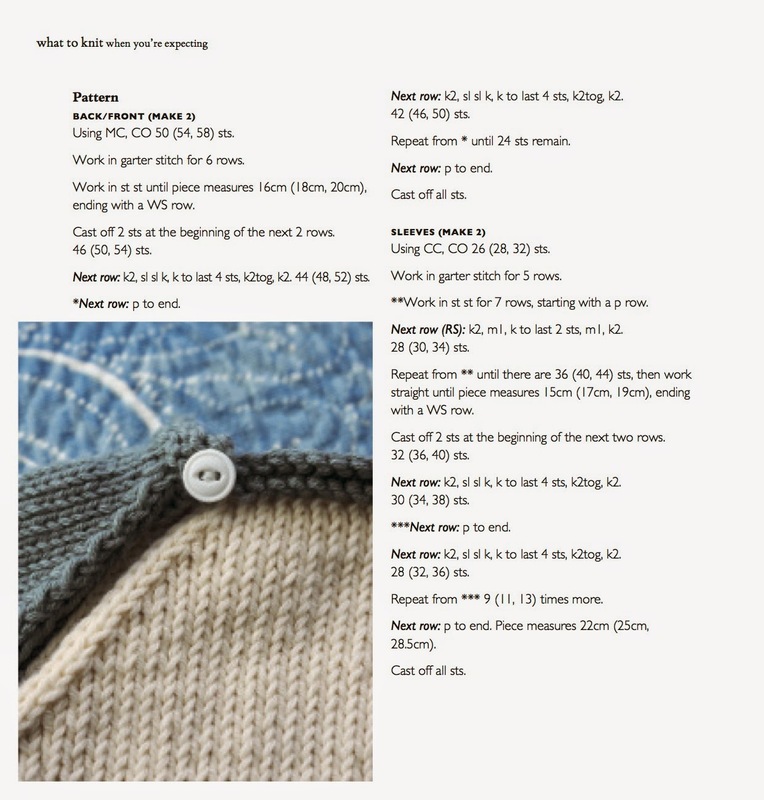 Knitting the first size on the Joseph cardigan and the decreases on the buttonhole rows don't tie back to the resulting stitch count even taking into consideration the errata I saw on this page. When I get to the row where I cast off to prepare to attach the sleeves, how many stitches should I have for the first size. Hi there. I'm in the middle of doing Keaton in the smallest size and have run into the same exact problem. I'm working off a book printed in 2014, so it's understandable that the mistake is still in the book given that someone spotted it in 2015. But this is now 2017 ... I did search for errata for this pattern before I started and found the errata page on your website, but it had NO NOTE for this pattern. I find that frustrating that you had not updated the errata page on your website, which would have saved me from making the error. I am having a problem with the Honeycomb blanket. On the honeycomb section the note is to not work the first stitch after the marker in cable pattern, but which marker? I also don't understand the instruction to work the increased stitches in st st. They way I interpret this is to work all three 'corner' stitches in st st with (the three stitches surrounding the markers). Sorry if its really obvious and I'm just complicating things!! love all the pattern in the book I've made quite a few of them now!! I have knitted the 'Owl & Monkey hats' from WTK: The toddler years.Page 58, instructions read: 'Owl horns.......pick up & k 8 sts along top of hat to one side. as pictured' - but I cannot see the owl horns in any of the pictures! Can you help, please? PS I have also knitted the 'train on the track' sweater, it's great! All Patterns Copyrighted by Nikki Van De Car. Simple theme. Theme images by Jason Morrow. Powered by Blogger.